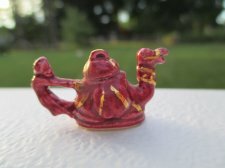 Home :: * ARTISANS :: Janice Crawley :: Janice Crawley ~ 1993 Porcelain Dragon Teapot ~ Terrific! Janice Crawley ~ 1993 Porcelain Dragon Teapot ~ Terrific! This is a terrific piece by Janice Crawley. The dragon teapot is just terrific. Made and signed in 1993, this has been kept on a shelf and is from an upscale collection. The Asian theme is great and the handle is a person, the spout is the dragon. Great piece. Approximately Measures: 1 1/4" x 3/4" x 1/2"